The PS4 has never seen a game like Horizon: Zero Dawn. Okay, yes, the platform has seen great open-world games in The Witcher 3 and Dragon Age: Inquisition; but Horizon: Zero Dawn will most likely be remembered more fondly than either. Yes, we think it’s that good. We say that because while the game isn’t without its shortcomings – by that we mean it’s glitchy, as all get-out and boss battles are generally incredibly frustrating affairs – it does so much else right. The game’s characters are a memorable lot. The story is confusing at first and then profoundly deep towards the end. Combat is brutal and while every enemy can – and often does – kill you, it never feels repetitive. Even the open world that Guerrilla Games has built here is large, complex and unique in its offerings. 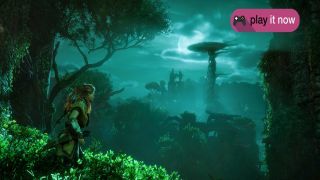 Obviously it’s fair to disagree or point out its other issues, but by and large Horizon: Zero Dawn feels like it could be the next Uncharted: a staple in any PS4 owner’s collection. Some of the game’s appeal, very obviously, comes from its premise. You play as Aloy, an outcast living in a post-post-apocalyptic world where self-replicating mechanical dinosaurs are hunted and scrapped for parts. While it might sound unlike anything you’ve played in the past, the result here feels familiar and welcoming. But that being said, Horizon: Zero Dawn is set in a surprisingly weird place and time. It has walking mechanical creatures that roam its surface, and yet most of the world and its inhabitants look like something out of the earliest human era. Most of Aloy’s tribe, the Nora, live in huts, use spears and believe that the robots were sent to purge the world of sin. Their neighbors are the Carja, sun-worshippers who believe that machines can be used to rebuild humanity, but lack the knowledge to do so, and live in a cluster of clay homes under the hot desert sun. Then there’s the Shadow Carja, a faction that split off from the Carja when the last emperor died, and who now live on the untamed western edge of the world. You’ll visit these tribes’ villages from time to time to complete a miscellaneous side-quest or pick up the next weapon, but most of the game is spent living, foraging and fighting in the vast pre-slash-post-historic world. And if it feels like something is happening beneath the surface of the game, you’re right, there is – quite literally, in fact. At the game’s outset, Aloy, as a small, brave, curious and strong-headed girl, falls into a cave littered with old electronics. It’s a scientific research lab from our time where she begins to learn about The Old Ones (that’s us). It's here that she discovers a Focus, a multipurpose tool from our era that enables you to scan objects to find weaknesses and interact with relics of the bygone technological era. Aloy is rescued in short time by Rost, an outcast like Aloy, but also her protector and surrogate father. The relationship that forms between the two characters sets the pace for the game – it’s both heartwarming and mysterious. It’s Rost who teaches Aloy to hunt and scrap the beasts, and who also provides direction for Aloy’s moral compass. But it’s the question of who, exactly, Aloy’s mother is that eats away at her, and serves as the primary motivation for her to eventually leave her home and wander out into the wide open world. While the question of who Aloy’s mother might be what constitutes most of the game’s plot, there are two more questions that you’re asked to figure out: why have the once-docile machines become more aggressive recently and why are the machines here in the first place? It’s impossible to answer either of those questions without ruining the plot, and honestly one of the game’s greatest joys comes from formulating your own theories on the subjects. So let’s instead talk about the stars of the show: the machines. There’s a crazy amount of bio-mechanical diversity to hunt, control and be killed by in Horizon: Zero Dawn. The creatures you encounter at the beginning of the game are simple at first –robotic raptors called Watchers, which alert nearby creatures when you walk by and animatronic antelopes called Grazers – but quickly evolve into more wild forms. By the end of the game you’re fighting Thunderjaws (robotic versions of Tyrannosaurus Rex that are equipped with lasers and drones) and Deathbringers (septopedal war machines) on a fairly regular basis. While every robo-animal doesn’t have an elemental affiliation, many of them do – Glinthawks, mechanical birds of prey, for example, have special ice canisters on their chests that enable them to drop chunks of ice from above. Understanding which element (fire, electric, ice) a creature uses is imperative to taking it down. And that’s where the Focus comes in. The device attached to Aloy’s face is for more than just show – it allows her to scan for weaknesses, too. You might have seen this mechanic in games like Batman: Arkham Asylum or the dozen-or-so action game clones that have come out over the years, but the major difference here is that using the Focus prevents Aloy from doing anything else. That means no running, no dodging, no fighting at all. Knowing when to stop and scan an enemy therefore plays a major role in your combat strategy. To that end combat is generally a fast-paced, almost button mashing affair where you’re trying your best to avoid projectiles, dodge incoming melee attacks and at some point fire a few shots of your own at your attackers. But because enemies can quickly overwhelm you, your best defense for most scenarios is to set traps – either snares or tripwire – to incapacitate or damage your enemies before they get too close. The final piece of the puzzle is the game’s crafting system, which we found to be deep enough to reasonably explore and invest in without being an endless resource-sucking void. You’ll need to keep yourself fully supplied in combat – the enemies can soak up a surprising amount of damage before going down – which means you’ll need to spend some time foraging, but running out of supplies happens so infrequently that it’s not a major problem. The whole experience might at first seem a bit overwhelming – encountering enemies, scanning for weaknesses, crafting ammunition, setting traps and then taking out the enemies at a distance – but by the middle of the game you’ll get into a groove in which this all becomes second nature. As far as mission structure is concerned, because the game is open-world you’re welcome to take on any quest at any time. To stop you from getting too far ahead of yourself, though, Horizon: Zero Dawn employs some light RPG elements. There’s a level system and traditional skill tree here, but you’ll never find yourself allocating points to specific attributes. Each level, you’ll gain a skill tree point and 10 extra hit points – not a massive help, but if done enough it makes some of the game’s later levels less frustrating. Taking on extra side quests or exploring the world’s surroundings help speed you along your path, obviously, but they’re not absolutely necessary if you’d rather stick to the critical path. Until now, we’ve very carefully avoided talking about how Horizon: Zero Dawn looks. One reason for that is because we're reluctant to lavish praise on a game’s artwork unless it is, for lack of a better word, a true piece of art. The other reason is that we spent all of our time playing Horizon: Zero Dawn in 4K HDR on the PS4 Pro – a great option if you have all the equipment to make it happen. That said, we thought the game looked stunning 95% of the time. There were a few areas – typically inside caves – where the textures were simply too dark to see and the lighting was completely off, but cut-scenes and conversations almost always looked great. But we probably have the TV or, more likely, Sony’s all-powerful PlayStation 4 Pro to thank for that. What we want to avoid saying here is that the game will look gorgeous on any screen you play it on – it might, but we have some reservations. Given more time we'd have like to have tried it with a variety of TVs and our standard PS4, and for that reason we'll just say we think the game is aesthetically interesting regardless of which console you’re playing on and which resolution you have, and leave it there. Without gushing too much about the game, Horizon: Zero Dawn is excellent. It’s the first must-own game of 2017, and one that will certainly be in contention for a Game of the Year award. The complaints we could see others having are that the game’s story – especially in the beginning – feels a bit clichéd, and boss battles are almost always way too hard, even on easier difficulty settings. The camera feels too close for comfort, especially when you’re already stuck in confined areas like the various caves, and weapon selection should be more varied. There’s also the odd glitch here and there, as well as one or two poorly synced voiceover tracks – although this is something Sony says the game’s developer is working to fix. However, these are minor complaints about a game that overall really impressed us with its outstanding presentation and gameplay. We highly recommend it. Horizon Zero Dawn was reviewed on the PS4 Pro.